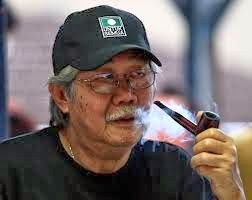 The author of the blog " Zorro Unmasked," Bernard Khoo passed away yesterday. Bernard began his career as a Christian Brother with the de La Salle Brothers , he taught at the La Salle School in Klang in the late sixties, he was then known as Brother Arnold, he left the brotherhood later. In the mid seventies he joined Texas Instruments as a member of the Human Resource team then know as the Personnel Department as Personnel Manager, and later moved to Goodyear tires to head the Training department there. Bernard would later join the man who took him into Human Resources Latif Sheer Mohammed in his consultancy SMPD Consultants where he remained till he retired. An active blogger Bernard always encouraged me to continue writing. To his wife and Children my deepest condolences. Those who wish to pay their last respects to the late Bernard Khoo may do so at PaRlour 1 of St.Ignatius Church, Petaling Jaya on the 5th and 6th of April.